I am confident that by the time you finish reading this review you will be registering with one of the best forex brokers out there. This is not just about this quality of the review but the fact that Instaforex is trustworthy and worth it. This article is dedicated to both beginners and advanced traders. You will find that, regardless of your level of experience in trading, Instaforex will fit right in. Let’s catch to the chase, you will admit that sometimes, no matter your level of experience, you will need guidance and directions for a new broker that you might want to check out and probably try. Today I present to you Instaforex, their trading policies bonus system etc. I will leave you to be the judge. Instaforex is a Russian based brokerage firm that was launched in the year 2007. That was the same year that the interest into the financial market was peeked by both regular traders and financial service providers. Instaforex is licensed and regulated by RAFMM. Considering all its achievements, suffice to say that instaforex has proven that the success of a financial brokerage firm is not dependent on its location. It is one of the most recognized brokers in the industry. It has proven that brokerage firms that do not originate from the UK or Cyprus can also succeed. You can contact the customer support team for any inquiry via phone, e-mail, live chat. Instaforex has a 24/7 customer support system. Which means that at any time on the day you will get solutions to any problem that you might be having concerning the platform. The website supports multiple languages such as English, Russian, Malay, Indonesian and Arabic. As such you can reach the customer support through with any of these languages. Instaforex uses the 5th version of the Meta Trader 4 software. Instaforex also has the mobile version of the platform available on Google Play store and Apple store depending on the type of operating system you are using on your phone of tablet. Ego you can trade on your mobile phone at your convenience. There are two fundamental account types on Instaforex. These are the demo account and the standard account type. The demo account is meant for you to have a feel of the interface of the platform and also learn trade properly. You will be surprised to know that, the minimum requirement to open a standard account is $1. This makes it possible for everyone to trade on the platform. This feature of Instaforex is a great advantage for beginners who want to start slowing with little amounts in order to not lose huge sums. The following currencies are options that you can open you can open an account in. These include RUB, GBP, EUR, and USD. The deposit and withdrawal methods are bank wire transfer, debit card, credit card, Paxum transfer, FilsPay, Webmoney, Union Pay, Neteller, UCash, and Skrill Moneybookers. The maximum leverage offered at instaforex is 1:1000. There are different spreads but an average is about 1.6 pips. There are over 107 assets available to choose from when making trades. These include 34 U.S. Stocks, CFDs, futures CFDs and many more. They also offer training courses that will help you better your training skills and knowledge. 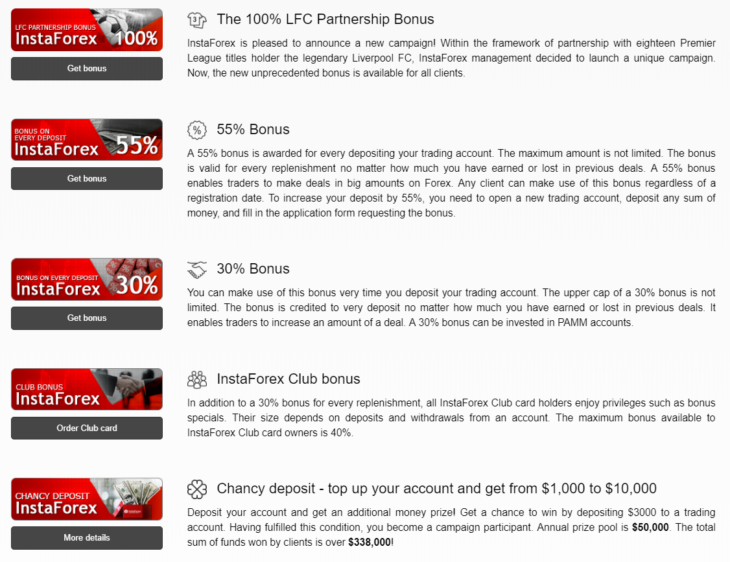 There are many bonus systems on Instaforex that is available to traders to take advantage of. Amongst them are as follows. 55% bonus on any subsequent deposit you make. 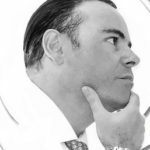 Ricardo Martinez has been active in the financial markets for around 10 years. In the early days in his career he was a trader and worked as market analyst in different online brokers advising clients on key decisions of trading instruments in foreign exchange and commodity markets. Ricardo is currently working as independent trader with diversified portfolio over different markets. His writing for LearnMarketonline is part of his commitment to share knowledge with traders.